Hubby likes colorful food, originally uploaded by arahbahn. 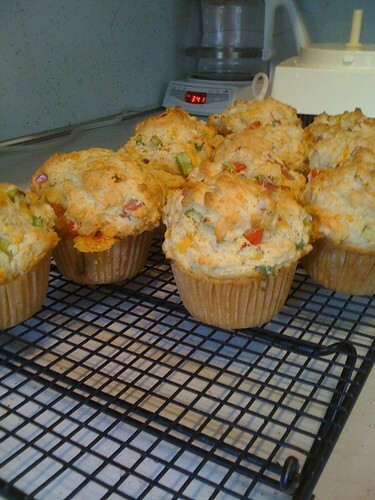 I’m not entirely sure that my slow, flat 8-miler yesterday gave me a need for recovery fuel, but here’s what it ended up being: one of the Buttermilk Ham & Cheese Muffins that I made on Saturday. 27.3 grams carbs, 9.6 grams protein were in it. It was perhaps a little high in fat (19g), but the buttermilk & cheddar in them supplied me with some necessary minerals. Mom brought us a batch of these, on our rock climbing trip in May, and this is the first time I’ve tried the recipe. My last two runs felt great, which was surprising: I went into Friday’s afternoon 5-miler with sore soles, and both runs were on pavement, not nice soft cushy trail. On Friday, the sore soles melted away in a few minutes (how’s that for a defense of orthotics + motion-control shoes? Perhaps I should have worn them all day). Yesterday, I had trouble establishing a breathing rhythm until mile 4.5- which was right after I’d downed a Vanilla Bean-flavored Gu. Then, the rhythm and ease were just yummy. I almost wished I’d plotted out a longer run! As much as I’d like to give full credit to the sweet goodness of Gu, I think part of my unease in the first half of the run was due to a flaky HRM. Dad recently sent me an medical-journal article about the dangers of marathon running, an although I’m not presently running, or even interested in running, such a distance, it’s got me worried. My conclusion, based on his advice: I’m 40 and doing some pretty challenging run workouts, weekly. I need to line myself up for a cardiac (not just metabolic) treadmill test, somewhere, and until then, I’m going to watch my HRM closely. I’ve never had any symptoms or checkups that lead me to believe that I may have a problem, but, well, Dad is both a cardiac specialist and a runner. I’m listening. My max in a recent 5k got up to 179, which was higher than I’d ever seen it. Not a lot higher (a possibly flawed fitness-club treadmill test showed my max to be 172, a few years ago), but higher. Plus, this was the first 5k (in the last 20 years) in which I’ve kicked hard into the finish and been rewarded for the effort with a nauseous feeling. My HRM yesterday, several times, read seemingly impossible readings like 180 or 200. I wasn’t working hard, though it was warm (80). The readings made me second-guess my perceived exertion, so I stopped to do a manual pulse check, and every time, it wasn’t extraordinarily fast. Then I’d flick the receiver or adjust the strap, and it would go back to a reasonable reading: my average rate for the whole run was 142, which is actually somewhat low, for me. Maybe my training is working? So, anyways. Anxiety ruined half my run yesterday. I’m glad it improved. At mile 7 I even got a nice refreshing sprinkle of rain. It’s true that one should not jump into strenuous activity starting from nothing, but it is possible to run well even with heart abnormalities. I’ve had WPW a-fib (your dad will know what that is – it’s common) during runs, where my heart rate was 230-280 and I passed out in mid-stride. I’ve had a heart rate of 0 – flatline – for 20 seconds, during a race, which I actually finished. 33 years of running, about 600 races, more than 30 wins. If it were up to cardiologists, I’d have the corrective surgery or not run at all. Once again, the ultra runner out-toughs this climber/mountaineer, alpine skier, snowboarder, and (former) rugby player. Maybe my survival of not one but three Bikram yoga classes can compare? :) I had to pare it back to very-warm yoga. Dad (who reads this -HI DAD!) had total knee replacement recently, and I believe he was out running with it, within a week. Against his orthopod’s instructions. The medical part of a picture is only a part of the whole picture in this life, right? I’m no ultrarunner. I’m a speed demon who just took up falling down on trails for 30 hours as a hobby. I’m too chicken for skiing, snowboarding or rugby, but I’m thinking about joining the high-pointers in climbing (though the thought of Denali has me running, screaming into the night). Doctors make terrible patients, but your dad undoubtedly knows his abilities and limitations better than the orthopod (or a cephalopod, for that matter). I have a non-running coworker who sent an aspiring marathoner my way with questions, telling her that I am an ultra runner. I attempted to correct her, and she said there was reason enough (probably my tendency to spend at least an hour on most trail runs) to call me an “ultra” runner, and besides, I did have some advice for the other woman. There are people who run ultras, but do you think that many of them accept the label of “ultra runner”? Maybe this question ventures into the “our species was built to run!” territory, which was covered in “Born to Run,” which I recently read & enjoyed. Speedy, you are! I don’t think I have the build to get a whole lot faster than I currently go, but I work on it. And I sure enjoy trail running.